Do you want learn crochet but don’t have any lessons in your area? Do you not have the time to attend lessons in person? 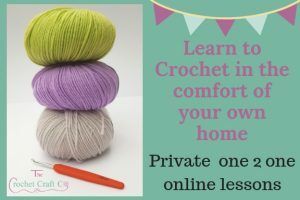 Do you struggle with mobility and would like a crochet lesson in the comfort of your own home? As well as running lessons regularly across Hampshire, I am able to run private one 2 one lessons online. By using some easy technology, I can offer a lesson, where, as long as you have access to a laptop or tablet with a camera, we can chat and see each other, whilst I talk you through and demonstrate the techniques. I also have an additional camera which will enable you to see my hands and watch how I crochet as we go and work together. Online lessons are £20 for an hours session. The lessons also include written instructions which I will send you prior to your lesson, for us to reference during the lesson but also for you to refer back to when you are crocheting along on your own! The following are some examples of beginner modules, however I am happy to be flexible with the lessons and if there is a particular technique you would like support with, we can work on this together. Hook explanation and holding your hook. Stitch terminology and the differences between US and UK stitches. How to do a slip knot. How to create your chain stitch. How to create a sc/dc stitch. Hints and tips for working in the row. How to fasten off your work. How to create a beautiful granny square. Step by step we will work together through a pattern to learn how to create this versatile project. How to create a hdc/htr stitch. How to decrease your stitches. For these lessons, you will need a 4mm crochet hook and double knit yarn as well as stitch markers. I am able to send these to you prior to the lesson, at a cost of £5.00 plus postage, should you not be able to purchase them yourself.